General Electric Flashbulbs Worlds Most Responsive Ad 1961 This is a December 22, 1961 advertisement It is a nice black and white ad from General Electric,, Photo Lamp Dept of Cleveland. 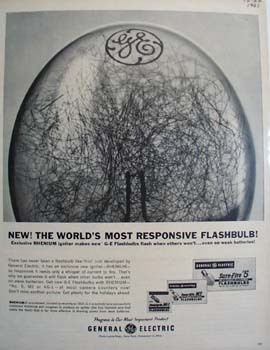 Ad has an enlarged picture of the flashbulb with the letters GE in a circle at the top of the bulb. Ad reads, ""New ! The world's most responsive flashbulb"" In excellent condition. Photo is taken through plastic and may show wrinkles or crookedness that is not in the ad. This magazine tear sheet measures 10 1/4"" wide by 13 3/4"" tall. Items Similar To "General Electric Flashbulbs Worlds Most Responsive Ad 1961"